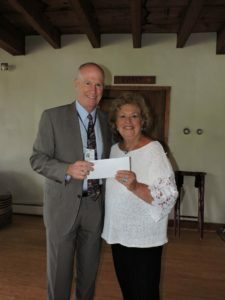 Out-going President of the Auxiliary of Charlton Memorial Hospital, Paula Raposa, presents Jack Dresser, Sr. Vice President of Philanthropy and Volunteer Services, with a check for $95,000 to help cover cost of the Harold and Virginia Lash Heart and Vascular Center that was built in 2015 at Charlton Memorial Hospital. FALL RIVER, Mass. — Southcoast Health announced today that the Auxiliary of Charlton Memorial Hospital has made a $95,000 donation to reduce its five-year, $500,000 pledge that will help to cover cost of the Harold and Virginia Lash Heart and Vascular Center that was built in 2015 at Charlton Memorial Hospital. “I would like to thank all of our Auxilians and the Charlton Gift Shop for working so diligently throughout the year to raise these funds, as well as all those who supported us,” said out-going Auxiliary President Paula Raposa after presenting Jack Dresser, Senior Vice President of Philanthropy, with the donation at the Auxiliary’s annual meeting on October 11 at Bittersweet Farm in Westport. After this third payment, the balance of the pledge is $153,000. New officers of the Auxiliary were also voted in at the Annual Meeting including President Marcia Liggin, Vice President Judy Menard, Secretary Carolyn Suneson, Treasurer Cleo Resendes, and Assistant Treasurer Kathy Rhodes. Newly-elected President Liggin spoke briefly about her plans for the coming year. She said that her three main goals are to increase membership, have more members participate in activities throughout the year, and to continue meeting the Auxiliary’s commitment to the hospital. The Auxiliary of Charlton Memorial Hospital, founded in 1956, is a non-profit organization whose purpose is to render service to Charlton Memorial Hospital, its tax-exempt subsidiaries, its patients and to assist in promoting the health and welfare of the community. The Auxiliary raises money throughout the year by various fundraising. Joining the Auxiliary is a great way to become involved in your community hospital. Members serve as ambassadors to the community on behalf of the hospital. For more information or to join the Auxiliary, please call Cheryl at 508-673-3679.